Did you know they were created in 1958! 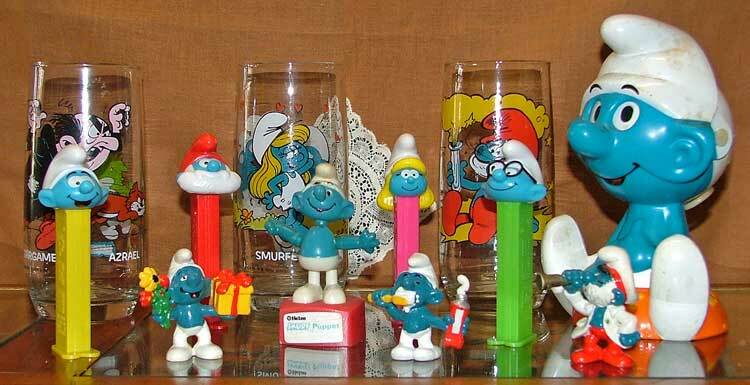 In the above photo, you’ll see that Bahoukas has a wonderful variety (well, as much as possible with the little blue Smurfs characters) that include new PEZ Dispensers, Chatter Chum – pull the string and he talks (the largest on the right), a Push-Puppet Smurf (in the middle), the tiny PVC Smurfs (in front) and a collection of Smurf Character glasses (14 in all) produced in 1982 by Wallace Berrie & Co. The storylines tend to be simple tales of bold adventure. The cast has a simple structure as well: almost all the characters look essentially alike—mostly male (a few female Smurfs have appeared: Smurfette, Sassette, and Nanny Smurf), short (three apples high), with blue skin, white trousers with a hole for their short tails, white hat in the style of a Phrygian cap, and sometimes some additional accessory that identifies a personality (for example, “Handy Smurf” wears overalls instead of the standard trousers, a brimmed hat, and a pencil above his ear). Smurfs can walk and run, but often move by skipping on both feet. They love to eat sarsaparilla (a species of Smilax) leaves, whose berries the Smurfs naturally call “smurfberries” (the smurfberries appear only in the cartoon; in the original comics, the Smurfs only eat the leaves from the sarsaparilla). What role did the SMURFS play in your growing up years? Or how did you cope as a parent? It’s most interesting to learn some of the changes connected to the SMURFS in the U.S. where they were changed from the original black characters to blue. So there you go … more than you ever wanted to know about Smurfs. Ready to add to your collection? Maybe you’re ready to start collecting. Either way, stop by Bahoukas Antique Mall and Beer MuZeum to see what we have. Of course, we’ll be watchin’ for ya!